I love serving others in my church. Bible studies, mentoring, counseling, administrative work – I enjoy them all. But one area of service where you will not find me is children’s ministries. I’ve learned that children are not my thing. Oh, they are cute as can be, and say the funniest things. They are curious and imaginative and full of emotion. I really love children. But my less than imaginative self does not work well on their level for very long. So I leave the serving of children to others. It’s really better that way, for me and for them. Except once each year, I get to serve the children in a big way. For one week, I get to be the photographer at VBS. And this was the week. Oh my, it was fun! I think this is my eighth year and I never tire of it. Early on, I would take a roll of 36 film every evening and we’d run it to a one-hour photo lab to have the pictures ready to for the parents to take home the next evening. Now, with a digital camera and a photo printer, I can take as many pictures as I want. Over the course of four nights, I processed and printed just shy of 400 prints. The kids love seeing themselves and the parents treasure the photos. It’s all fun and all reward. I wish I could show you a picture or two so you can see the precious faces of these little ones. But what I have shared above provides insight into another little fact about me. If I had to choose between the mountains or the sea, I would choose the mountains without a second thought. 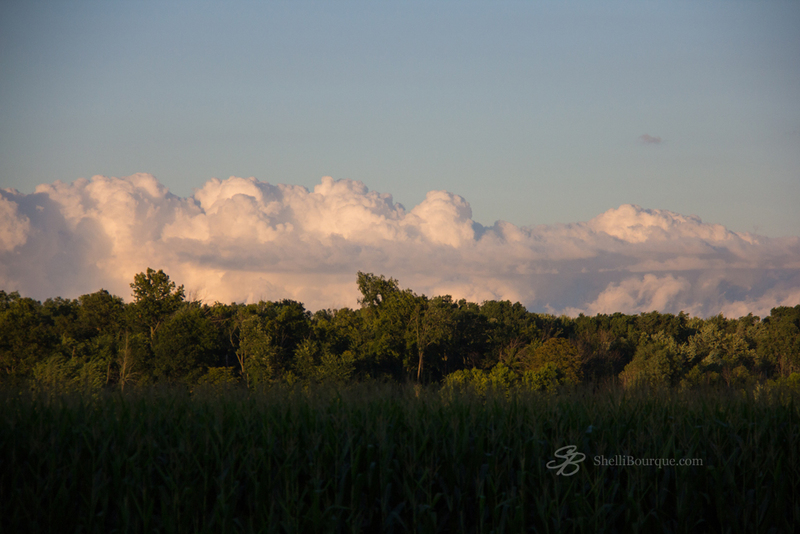 I love the mountains and after VBS one evening this week, while the sun was setting, beyond the corn fields and the trees was the most beautiful mountain range. It was made of clouds, and I had to stop and capture the beauty. I have only one link for you this week, but it’s a good one. It’s for parents, grandparents, those in children’s ministries, and was the perfect reminder for me as I struggled earlier this week. That night I began to find joy in the impossibility of it all. The task is way bigger than our ability as parents, but we’re not our children’s messiah, and we’re not left to the resources of our own character, wisdom and strength. Our children have a Messiah. He is with them and working in and through us. The wise Heavenly Father is working on everybody in the scene and he won’t call us or them to a task without enabling us to do it.